Sculptures change even as you look at them. Carvings differ from one time to another, under one light source or another, in one media or another — both the image and the original thing itself change. 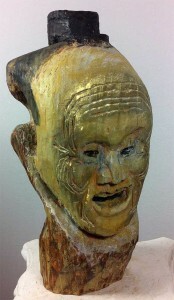 This web optimized photo of a sculpture I made in wood was inspired by a Nara period theatrical mask. Here you see it on the web, but the sculptured mask is already different from the photographic image: the wooden carving’s physical image changes with countless shifts in light and shadow. It’s one of three installed in my Head Case. 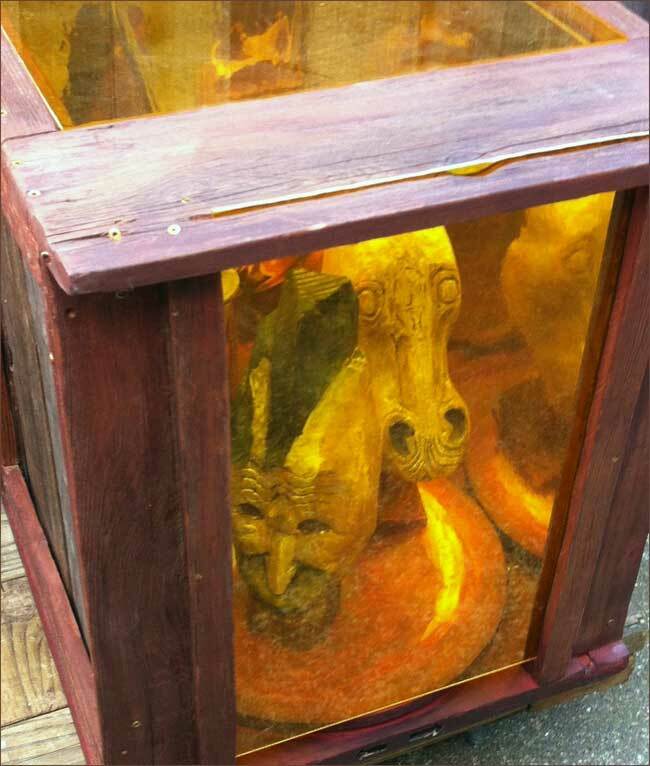 It holds upright three original sculptures of Japanese theatrical masks. Gold is their color (more or less). It survives as aging paint to embellish the carvings, and as filtered light passing through translucent yellow panels — one on the front for visitors to look inside, and one on the top to admit light from overhead, sun, moon and, yes, electric lights. Head Case with translucent gold panels, gold reflective walls & 3 masks mounted. Turn the table (at bottom), see multiple images of the masks and gold light change at the control of your finger. Gold light plays on the 3 masks as they turn and change their images on the 3 reflective surfaces. This head case measures about 20″ on each side of the cube – big enough to rotate three full-size masks on the turntable. Then, the image I originally had in mind — hasn’t that changed, too? n.b. If you want to see original Nara period masks and other fine carvings of the period, start with volumes 3 and 4 of Genshoku Nihon no Bijutsu. 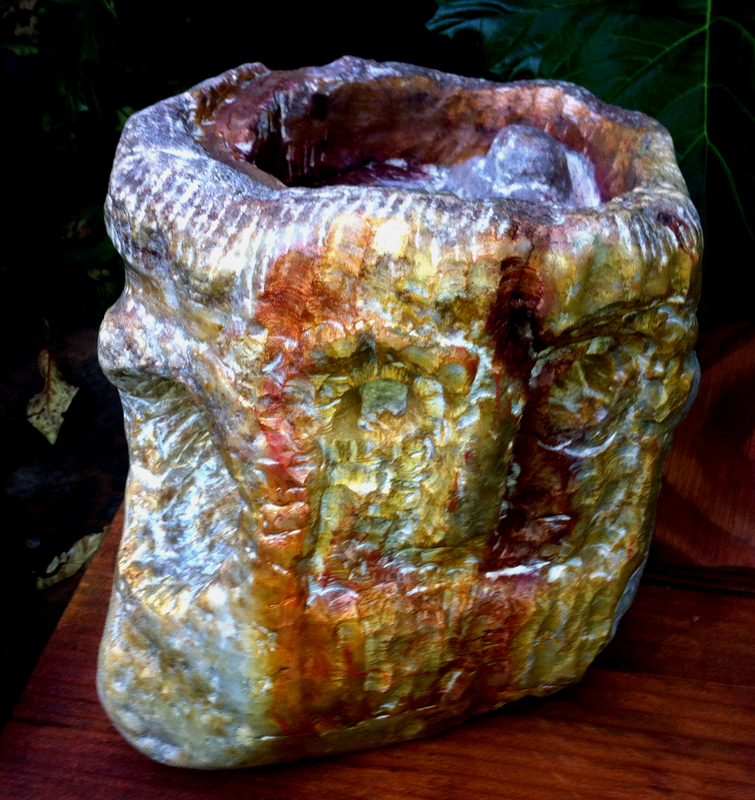 40 pounds of alabaster, skull sized ~ take care not to kick it in the dark, it will hurt your foot. Daytime, you can see that it’s colored with wood stain.